The longest living and most resilient tank of Poland’s death metal fleet has once again hoisted its flag – ready to overrun the world with its new triumphant procession. 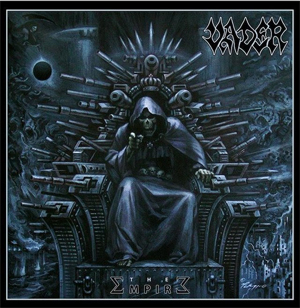 They recently fired their first warning shot with their Iron Times EP, and now VADER are building their own all conquering empire with new studio album The Empire (out 4th November). Today, the band revealed the cover artwork of that new masterpiece. This stunning visualization was created by acclaimed artist Joe Petagno who has also created artwork for PINK FLOYD, LED ZEPPELIN, MOTORHEAD, MARDUK, ILLDISPOSED and SODOM. "Send Me Back To Hell"
The lyric video of the brand new track "Prayer To The God Of War" has been released and you can check it out below.